After the lengthy discussion of the construction V+Vsubjunctive in Mark 10:36, I thought it would be worthwhile to look at some possible paths of development for the variation we find in Mark 10:36. What I want to demonstrate here is the high value that a broader knowledge of the Greek language and its history can provide. “The syntactically impossible reading of א B, τί θέλετέ με ποιήσω, must result from a conflation of the two constructions. The reading which best explains the variants is τί θέλετε ποιήσω (with ἵνα understood), the abruptness of which led to correcting the subjunctive to an infinitive, with the consequent addition of με” (R. T. France 2002). This line of textual development necessitates that France is correct about the construction being “abrupt.” But the data suggests that it probably isn’t. More likely this is a perfectly normal construction that is substantially more common in the everyday speech of Greek speakers that has on various occasions through the history of the language slipped into the literary language—notably only in speeches and dialogue. From there, France (Holmes, among others) would have us believe that the second corrector of Sinaiticus (6th-7th c.) had a superior text to the original corrector (4th c.)while that same original corrector agrees perfectly perfectly with Vaticanus. It seems to me that this line of reasoning takes the impossibility of the reading as its starting point. But we already know now that it isn’t impossible. It is, in fact, quite natural. We also know from Markopoulos’ table above that the V + Vsubjunctive construction begins to die in Early Medieval Greek—around the same time that Sinaiticus’ second group of correctors work to bring the text in line with the Byzantine tradition. At that point in time, the infinitive reading had already been introduced (as evidenced by Alexandrinus) and it’s consistently looking more and more appealing to those scribes. On top of that, the more rare this construction gets, the less acceptable to scribes the additional με appears. In response, some scribes change the subjunctive to an infinitive and other scribes just drop out the pronoun. On this account, accepting the reading of the NA27 allows for deriving most of the variants directly rather than relying of an incredibly complex line of derivation as the one that France proposes. At least, that’s how I see it, but I’m not a text critic. I’m a linguist who dabbles in it from time to time. I would be curious about anyone else’s thoughts on this proposed reconstruction. * א* lacks the entire line as a result of homoioteleuton from the θέλομεν of v. 25 35 through ἵνα of v.37. The variants and the manuscripts listed are taken from the apparatuses of Tischendorf and the UBS4. Based on my understanding of the external evidence, the two readings with the best claim to the oldest form of the text are τί θέλετέ με ποιήσω ὑμῖν; and τί θέλετε ποιήσω ὑμῖν; with the subjunctive (the Old Latin “quid faciam vobis” also supports the subjunctive, as dose the singular reading of D). The difficulty is the presence and position of the enclitic με. Initially, I thought it was syntactically impossible (or at least too difficult to be original), but, upon further research and consideration of your discussions, I have become satisfied that it is indeed possible in everyday speech. Therefore, I favor the reading τί θέλετέ με ποιήσω ὑμῖν; as both the harder and earliest reading that also explains the diversity of scribal attempts to improve the idiom. In fact, I would remove the brackets. and it’s the third line up from the bottom. Being a little nit-picky, eh? That was fascinating. I’m glad people like you exist, Stephen. Nevertheless, I still had one mystery to solve—how is it that the scribe of 2427 had access to a critical edition that the great Ernest Cadman Colwell did not? I am saving the answer to this puzzle for my Tuesday morning session at SBL (S21-18). The answer is that unfortunate divide between Classicists and NT scholars. The Buttmann edition belongs to the classics library published by Teubner and therefore accessible to classicists, but it is relatively unknown to NT scholars. The Buttmann edition is not mention in the history of the printed editions of the NT in any of the handbooks and neither of Colwell’s libraries at Chicago and Claremont had a copy. You sure know how to depress a guy. I had thought this classics/biblical studies split was limited to the more recent generations. Its saddens me to hear that it is significantly older than that. and it’s not homoioteleuton from the θέλομεν of v.25 through ἵνα of v.37. The omission runs from ἵνα of v.35 to ὑμῖν of v. 37, the h.t. being from one ἵνα to the next. Okay, it’s a codicological problem in my copy of WH. The footnote giving θέλετέ με as a marginal reading is on the previous page, which ends at v. 32. And the h.t would have taken up five 12-letter Sinaiticus lines. It takes up three in miniature script. The change from the infinitive of the majority text to the subjunctive (particularly a subjunctive without ἵνα) is the most improbable change there could be. The assumption here is that the change was deliberate and due to the desire to substitute a preferred construction. It’s worth noting, though, that about 70 minuscules omit the με, i.e., 30 go with the reading of C and 40 with that of W* (see Willker’s summary of the ms evidence from the Text und Textwert volume at http://www-user.uni-bremen.de/~wie/TCG/TC-Mark.pdf and scroll down to TVU 232). This shows that accidental omission of με was common, and indeed it’s hardly unexpected after the syllable ΤΕ or for that matter after the syllable ΣΑΙ since ΑΙ was pronounced as Ε. Such leaps over syllables are common enough in the mss. Thus, if the original construction was accusative and infinitive, and the με was then accidentally omitted, a subsequent scribe could restore the sense by inserting it again (before or after the verb). Or, alternatively, the scribe might easily think the number of words in front of him was correct but one of them must have been miscopied, in which case he could have changed the infinitive to a 1st person subjunctive. The reading of B could be an alternative attempt at restoration. The only assumption being made here is that I’m only talking about deliberate change. I find the change from the infinitive to the subjunctive the most implausible change across the board. the scribe might easily think the number of words in front of him was correct but one of them must have been miscopied, in which case he could have changed the infinitive to a 1st person subjunctive. I feel as if there are a number of point that were in your head that didn’t make it to the comment body. Which words might the scribe have thought correct and which one might he thought must have been miscopied? And (more importantly) why would he think that one of the words was miscopied? As it stands, your suggestion is too vague for me to accept. How about accounting for the scribe of 2427 so improbably correcting his text from the infinitive to the subjunctive? Based on my examination of the image, it looks like 2427 corrected ποιῆσα to ποιῆσαι (Buttmann reads ποιῆσαι), so there’s no subjunctive to be accounted for. I’m not sure how relevant that is considering it was written post-1860. Is this one of those cases in which Buttman had a faulty reading of B? Which words might the scribe have thought correct and which one might he [have] thought must have been miscopied? And (more importantly) why would he think that one of the words was miscopied? Sorry I expressed myself badly. I’ll have another go. The text that results from omitting με from an original accusative and infinitive construction is τί θέλετε ποιῆσαι ὑμῖν; “What do you want to do for you?” Whereas some scribes would simply copy what was in front of them, others, having just copied verse 35 with a 2nd person reference “we want you to …” and having some memory of how the episode continued, would be expecting after “What do you want …” some word that signals a 1st person reference. In yesterday’s post I was trying to say that such a scribe would restore the 1st person reference, either by supplying the missing με or by changing the infinitive form to a 1st person subjunctive. If there’s more than one way of making sense of a faulty copy, there’s no guarantee the reader will choose the one that the original author wrote. I first thought this would have been done consciously, but it needn’t have been conscious at all. People quite often unconsciously misread a text to fit what they think it should say. In 10.51 there was no great rush on the part of later scribes to change the subjunctive to an infinitive construction. The only variation of any significance there is in the position of σοι (not noted in the NA apparatus). I take the stability of the text in 10.51 as evidence that scribes were not interested in replacing θέλω + Vsubj constructions. 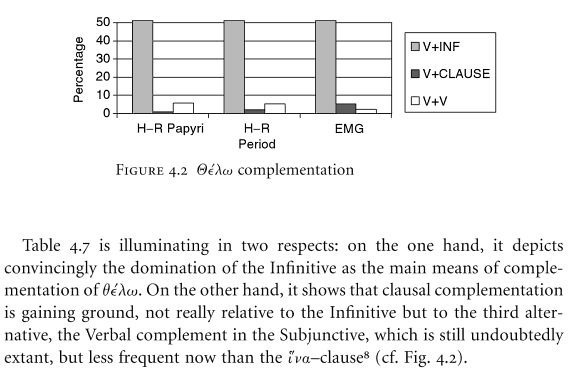 This discussion seems to beg the question that the infinitive is original, but the external evidence goes against it. Stephen, your assessment of the external evidence may well go against it. Going back to your first post, though, I wouldn’t put any wait on D: it is well-known to paraphrase the text. The reading of C τί θέλετε ποιήσω ὑμῖν; uses the same construction as in 10.51, not to mention 14.12 and 15.12, and this construction was not ordinarily altered by later scribes. Therefore the C reading looks unlikely to have given rise to such a profusion of variants, and so is not a good candidate for the original reading despite its being preferred by various editors. You evidently prefer the reading of B, although its construction is unexampled elsewhere. It’s fine to prefer the harder reading if indeed it’s both possible and fits the flow of the discourse. But that is where I am not convinced. What would be the function of the με? I prefer to see B’s reading as the result of an error and to look elsewhere to explain the development of the various readings. To write off the infinitive reading because it is not the reading with the earliest extant witness would be premature. And in fact it has 4th c. witness, because the Gothic version five times (Mk 10.51, 14.12, 15.12, Lk 9.54, 18.41) renders the Greek subjunctive after θέλω with a Gothic optative (e.g. Mark 10.51 hva wileis ei taujau [1st ps optative] þus?) but Mark 10.36 with an infinitive: hva wileits taujan [infinitive] mik igqis? Where did Ulfilas get his Greek from in the mid 4th c. for his version that Metzger describes as “severely literal” (Early Versions, 382)? You’re talking about B’s reading as if it’s singular, but it agrees with other early witnesses. Moreover, other early text-types (Caesarean and Western) corroborate the subjunctive. The infinitive looks to me like a secondary development later within the Alexandrian stream, from which it made its way into the Byzantine text. The Gothic is based on an early form of the Byzantine text (more related to A than to later Byzantines), so the Gothic is not telling us anything new. The subjunctive reading, though less elegant and classical than the infinitive, is not impossibly hard. More difficult is the presence and position of the clitic με, but that it is acceptable (spoken) Greek has been the entire point of this and the previous post of Mike’s. The με has the same as function as prolepsis (and here over co-subordination instead of the usual subordination), and that function is topicalization. At this stage in the discussion, it is not sufficient to merely assert that the τί θέλετέ με ποιήσω ὑμῖν; reading is an error, you have to now explain what wrong with the data and analysis that Mike has brought up. Believe me, I too initially thought it was syntactically problematic (then I was favoring the με-less reading) until I looked further into it, thanks much to Mike’s help. You’re talking about B’s reading as if it’s singular, but it agrees with other early witnesses. I didn’t mean to imply it was singular. But in fact it agrees with only one other early witness, the first corrector of Sinaiticus. Hardly surprising. And four other mss. This doesn’t explain why the infinitive might be a massively popular secondary development in Mk 10.36 but hardly occurs at all in the 9 other places where the θέλω plus subjunctive construction occurs in the gospels. In some cases ἵνα is inserted in some mss, and 1st ps plurals are frequently spelled with omicron, but altering to the infinitive is rare. The subjunctive reading, though less elegant and classical than the infinitive, is not impossibly hard. I didn’t say it was hard. It may be unfamiliar to classicists but it is well enough attested in the gospels (see above) and was rarely interfered with by later scribes. that [ τί θέλετέ με ποιήσω ὑμῖν;] is acceptable (spoken) Greek has been the entire point of this and the previous post of Mike’s. Well, I have read Mike’s previous post again, and I note he finds no examples with an intervening pronoun that is the object of the verb of wishing. His linguistic theory tells us it is possible but that’s not the same as saying Greeks actually spoke that way. As for topicalization, what would be gained by that? Why would Mark use such a construction in 10.36 rather than the subjunctive without με? Mike hasn’t found the data you need. He only thinks it’s theoretically possible. Manuscripts have to be weighed not counted. Your contrast between “only one … four other mss” and “massively popular” seems to reflect the fallacy that sheer numbers of manuscripts are more important than the history of the text. The Byzantine text is a late but extremely prolific group of manuscripts and it should be not accorded priority simply because it was copied a lot by medieval Greek Orthodox monks. As for Mike’s analysis, I see that you haven’t point out anything actually wrong with it, so I remain satisfied that the text is not syntactically impossible–an issue for which theory is important. There are less than 50 instances of θέλω+subjunctive in the texts that I have access to for morphological searches (which includes Perseus Classics and the Duke Documentary Papyri–which I received via Logos last month as a preview a few weeks ago. I doubt there’s more than two hundred or so across the history of the written language–I’m yet to find a satisfactory way of checking on the TLG. The V+Vsubjunctive construction is one of lower register spoken Greek that isn’t likely to make it into literary texts from the get go. Τhis clause is just as awkward from the perspective of *English* grammar as Mark 10:36 is, but here it is. Modal verbs can take accusative objects without an infinitive and they simply don’t translate into English. You can see the text here at 4 Baruch 3:9 in Jens Herzer's edition with apparatus. Can I find more? Maybe. I’m still combing through the data. As in the 4 Baruch 3.13 there is the ἴνα, but if its deletion is permitted (as it is in the Gospels), I know of no reason it won’t also be permitted if there is an object of θέλω. An example with deletion of ἴνα and inclusion of the clitic pronoun in the right position (albeit not topicalized) is: John Chrysostom, In Johannem, PG 59.204.48: Καὶ οὐκ εἶπεν αὐτῷ, Θέλεις σε θεραπεύσω; (“And he [the man at the pool] did not say to him, ‘Do you want to heal me? '”) Note that is direct speech. They (V+Vsubjunctives) are also virtually always questions. Those are both very nice nearly parallel examples.